Mary, co-owner first discovered yoga in 2003 at Gold’s Gym Burlington taught by Diane Hall. She knew she was crossing over into the wonderful world of teaching yoga when she tried to figure out what was next in the sequence of Diane’s asana. She started her teacher training with Yogasteps (2004) but completed the Triad Yoga Institute 200 hour teacher training in 2010. She has her MS in Sport Psychology from Florida State University (2002) and her BA in Psychology from East Carolina University (1999). She works full time for the City of Burlington Recreation & Parks Department coordinating B-Town Events and supervising B-Town Aquatics & Community Arts. 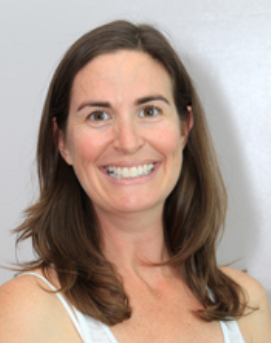 She is passionate about her student’s desire to discover yoga and start them on their journey of bliss. She is a believer in living in the moment and one of her mantras is everything happens for a reason. One such experience happened when she coached Susan’s son Taylor in 2007 as his Age Group coach for the YBAC Hurricanes. Through a mutual friend the two connected and started working towards opening the doors of Om Shanti (est. May 2009). Mary credits her yoga practice for teaching her the value of being patient, quiet and learning to listen. She is blessed with a loving husband, Brian and three children Berkley, Linen and Jameson. "Remember the emphasis on the heart. The mind lives in doubt and the heart lives in trust. When you trust, suddenly you become centered."